The Shepherds Hut Toilet trailer is a popular choice and always greeted with delight when it arrives on site . 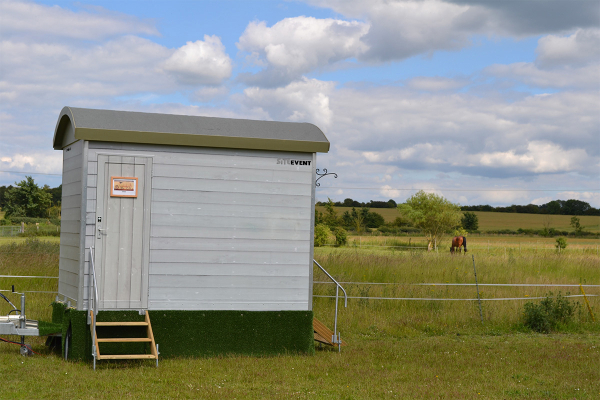 The Shepherds hut toilet trailer design is for those quintessential smaller events requiring something more harmonious within a country setting. This 1+1 loo can provide for 125 people for the duration of a typical function. The unit contains one ladies toilet and one gent’s toilet, though it can be easily be all ladies or all gents. Additional single event loos can also be added for events that cover a larger area. The Shepherds Hut Toilet trailer is part of our fleet of themed trailers consisting of the Potting Shed Toilet, the Beach Hut and the Gypsy Caravan. This range of toilet trailers are in high demand in the summer season and can be reserved with a deposit to secure them for your event. The outside is wrapped in a shabby chic green/grey with a darker roof. Wooden steps with safety handrails and a green grass skirt complete the pleasing look of this trailer. The interior is fitted out with luxury porcelain sanitary ware, high quality wooden cabinets and mirror. The Shepherds Hut Toilet trailer will require good access with a firm level surface to site it on. Our uniformed and dedicated driver will arrive by 4×4 and set this unit up. When he arrives he will require a 13amp power source, this can come on an extension lead so that he can test the unit before leaving. Water is supplied via a tank, though this may need replenishing during the event if the usage is high. Our driver will also leave consumables including toilet rolls, hand towels and luxury soap.